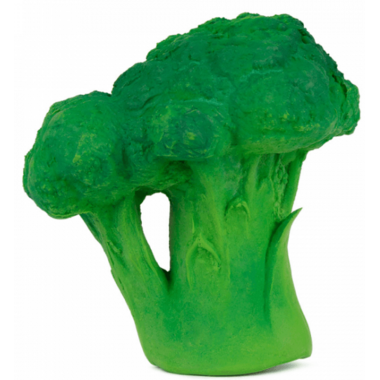 Brucy the Broccoli is a chewable fruit-shaped baby toy for sensory play, teething and bath time. Little gums love the texture of Hevea rubber. Soft and easy to hold by babies' hands. Materials: Made from 100% natural latex taken from Hevea Malaysian trees and hand painted with safe, natural food graded dyes. Care Instructions: To clean, simply wipe your toy with soapy water and a damp cloth. Store in a dry place. If left on the side of a bath or on tile that may be slightly wet or moist, the toys will start to mold (like any natural products). Air drying between use, is recommended. Do not leave the toy in direct contact with sunlight or any artificial light for long periods of time, as the color may fade away. Remove packaging and all tags before giving the toy to your child. Do not sterilize. Note: Due to the use of natural rubber, there may be minor variations in color and shape.